Katy Perry Said Never Say Never on Re-marriage Elle Magazine: Probably one of the hottest sessions of the Singer Katy Perry, is that after showing ‘a part of it’ in her new documentary, everyone wants to know more details of this exuberant artist, and ‘Elle‘ has succeeded. The U.S. edition of the magazine ‘Elle’ has ‘hunted’ to one of the artists followed the music scene. Katy Perry has achieved fame only, through perseverance and effort, everything else has gotten their attractive and unique style. 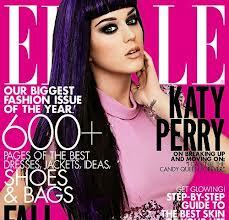 But in matters of love, Katy Perry is quite simple and this and more talks in his interview to ‘Elle’. Not surprisingly, after her divorce sounded all interviews are based around it and she is happy to talk of love. The truth is that although she lived a tragic break with I thought was the love of her life, she still believes in love. This interview seems more an ad to promote her single than a story about her life, since Katy Perry is spectacular. Although most telling of all the interview is revealing be open to the possibility of marrying a second time, any day. “I am a woman who likes to be courted. Never say never, I suppose you’ll say. I’ll let love acting freely,” says Katy. Still, Katy remains reserved about relationships after divorce has Russell Brand. First was the model Baptiste Giabiconi, after she was linked with the guitarist of Florence + The Machine, Robert Acroyd, but his latest conquest was another musician John Mayer. However, it seems they are becoming known, but John Mayer sure that when you see the cover of Katy Perry in ‘Elle’, no doubt will have to go with it forward.